I learned to ride a bike when I was about 6 years old. I had a nice little hand-me-down bike that I really wanted to ride, but we lived with a gravel driveway, off a gravel road. There is not much harder (for a little kid) than learning to ride a bike on gravel. My grandparents, however, had a flat paved driveway that was about 40 yards long. 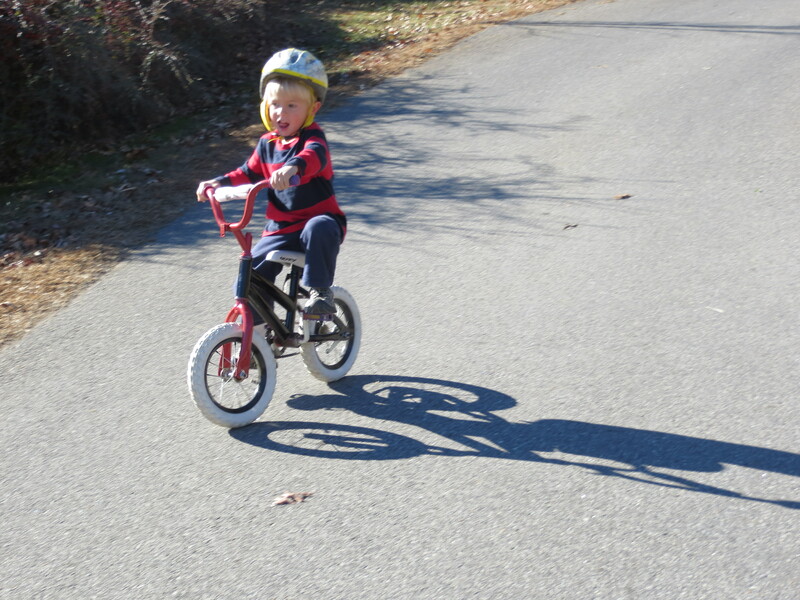 It was perfect for learning to ride a bike (except for a few mostly avoidably broken cement cracks). But, I was a nervous rider–I wanted to start out slow, which as anyone who rides a bike knows, does not work when you are learning. I kept with my unsuccessful, but comfortable, strategy for a few weeks. One day, my aunt, uncle, and cousins came for a visit. We all gathered as normal at my grandparents house, which was also where my bike was stored at the time. I got out the bike, and as normal pushed myself around with my feet trying to ride it. My uncle decided that he was going to get me riding a bike that day no matter what. Now, my uncle was a former NFL player and secret service agent. He was large, stern, and intimidated me (though he did have a great sense of humor). I was scared to death when he commanded me to get on the bike and pedal hard. I knew he was going to give me a big push, let go of the bike, and I was going to fall over on that pavement. And, that is pretty much what happened over and over until he got frustrated with me and went inside to eat lunch. I stayed outside, determined not to let my uncle down, but relieved to be on my own again. I got back on the bike, and started riding–discovering the key point that my strong uncle helped me realize. Pedal fast to keep your balance. I was so proud. 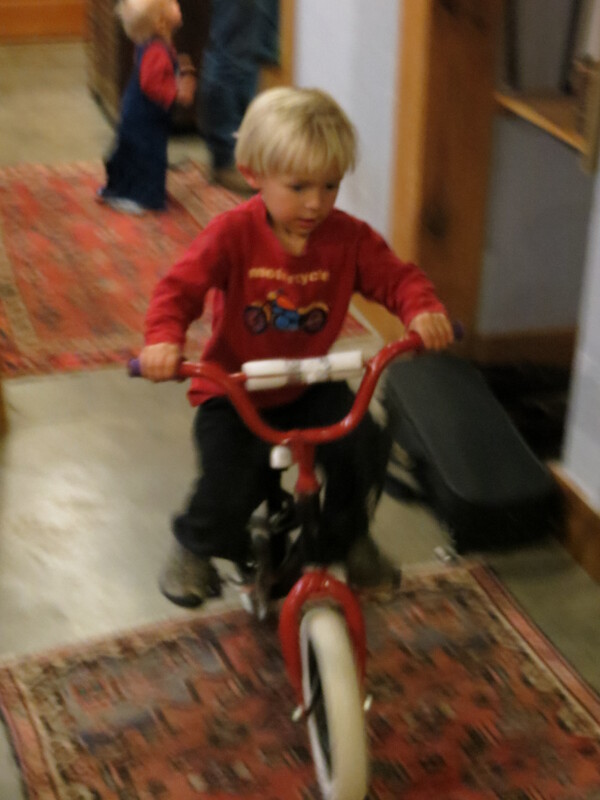 Fast forward many years, and we bought a new type of kids’ bike, a balance bike (essentially a tiny bike without pedals) for Christmas our son who had just turned 2. His older sister rode it for the first month we had it and at the end of the month when we gave her bike back to her without training wheels, she just took off on it and never looked back. 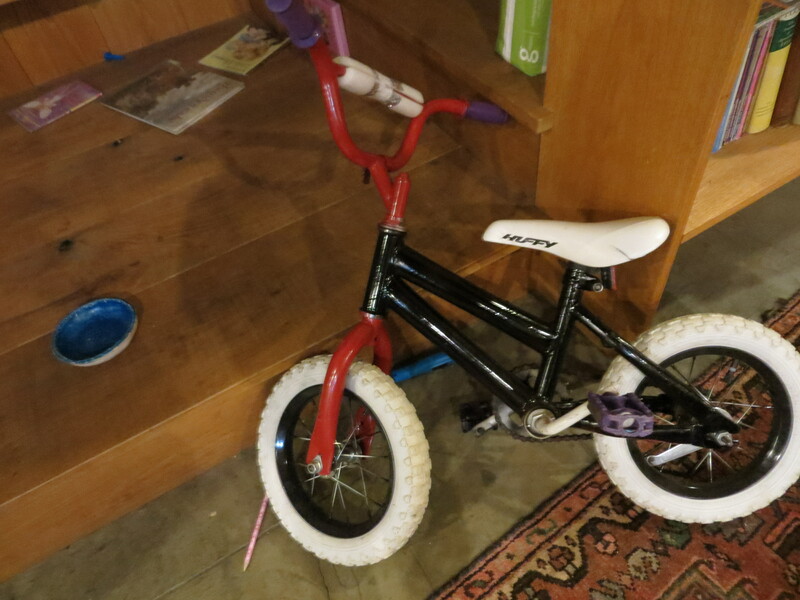 We realized this summer that Hythe (3 years old) was nearly big enough for a bike with pedals, and so this fall William fixed up Evva’s old bike as an early birthday present. William painted the pink and purple bike, red and black. He oiled the chain, changed the tubes, and it was ready for a little boy. 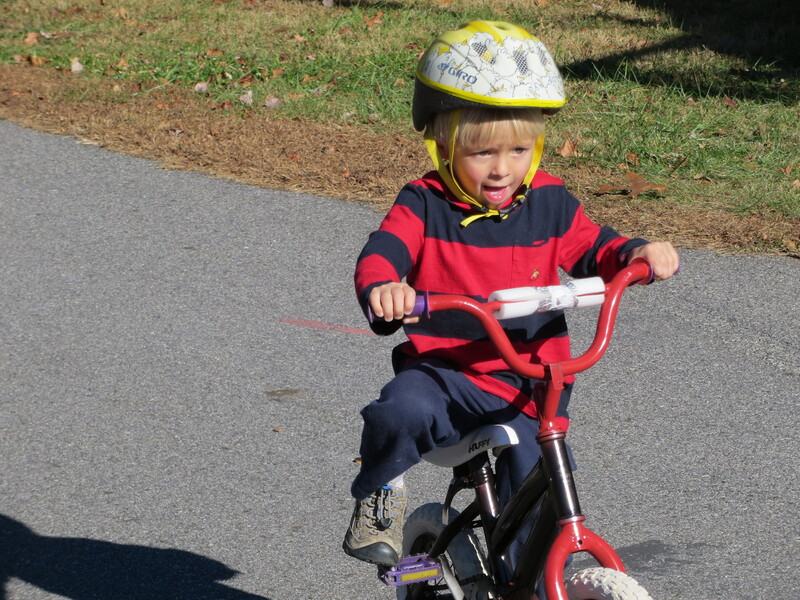 Then we took him (a helmet) and the bike to his grandparent’s driveway which, while flat, is gravel. 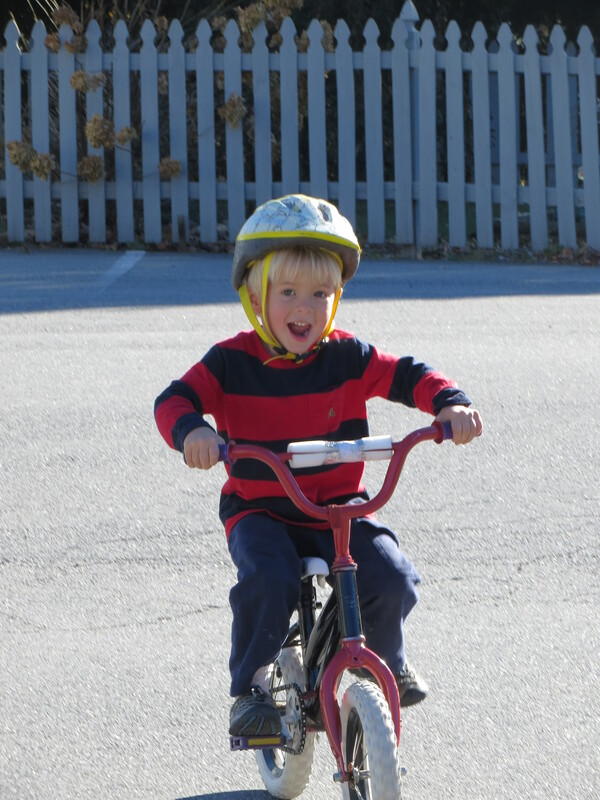 He took off on his little bike with no training wheels and didn’t look back. He practiced on the driveway, in the library parking lot, anywhere that was slightly flat. I am so proud (and amazed!). And, mostly glad he enjoys it so much.